Do like I did: sit in a chair with a ruler affixed to the center of the antenna resting on your shoulder and measure the pitch with a frequency counter. A stop on the ruler can help you keep your body at a fixed distance while your hand / arm moves, and notches in the ruler can help you quickly place your hand (I used my thumb tip as an index, though this isn't perfect). Do three runs and if they all look close to each other average them together. Plot them in a spreadsheet and check C vs. 1/distance and it should look really damn linear if your data is any good. This drove me to detailed capacitive simulation of the antenna / hand / arm / body / floor, where the results are cleaner and much more definitive IMO. A long skinny wire is the least sensitive but the most linear when heterodyning (where absolute sensitivity is less of an issue) though antenna geometry isn't as a huge linearity driver as one might think. "My vacuum tube theremins would hold the same musical note, say 300 hz over a ten degree F room temperature change overnight. The coils were kept lower than the hot tubes. This revealed to me that 95% of modern thermal drift comes from the behavior of PN junction transistor character mismatch. 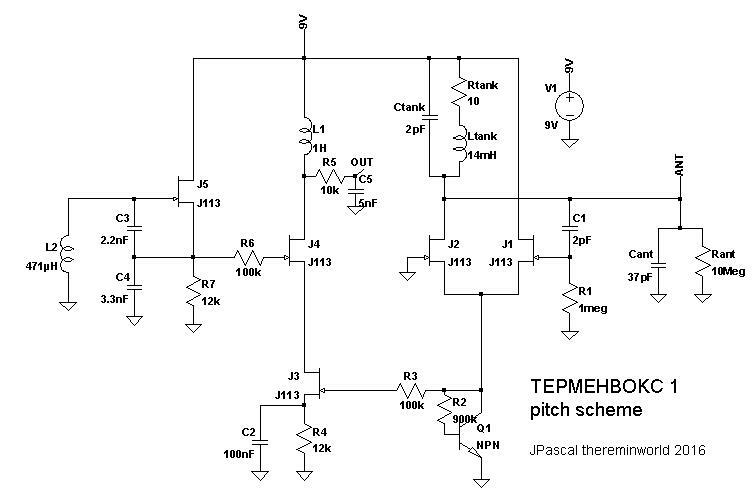 Any coil issue would be counter balanced by the dual oscillator design of the theremin." Without looking at your particular schematic, PN junction issues are possibly due to the way you are biasing and using the BJT in circuit. There are parasitic capacitances inside the transistor, the worst offender is between the base and the collector. If you use the transistor in an inverting gain configuration (input at the base, output at the collector) this capacitance gets magnified by the gain (this is the "Miller effect"). And coil drift only has a chance of cancelling if the oscillators are completely identical, which usually isn't the case. I found it really instructive to read blogs and on-line papers and such where ham radio operators discuss the design of super stable LC local oscillators (i.e. for transmitting and receiving). The use of low tempco ferrite coil forms requires them to compensate with reverse tempco caps. IMO you're better off leaving out drifty components if possible rather than relying on drift balance or compensation. And always voltage regulate; it's trivial to do and has a massive impact on stability. I know I sound crabby, but I'm really not trying to pick on anyone. It's just that some things need to be completely nailed down before you can even see the next level up. Linearity is one of those things everyone has to come to grips with sooner or later, but open / closed hand exercises (as valuable as they are) will only get you so far, and at some point are just a waste of time. Christopher, what does it mean behind xtheremin8, I dont realize it. Excuse my bad english, I hope to improve it with a little help here. Dewster, jFets I use indeed for simplifying the tube imitation. Highest input resistance und wellknown inner capacities. The LTspice Ascii file is very helpfull, duester! Until now I used Schematics from MicroSim Corp with a german version of Pspice. Most functions are similar but the handling and the shortcuts are different. The jFET J113 is a good replacement of BF245A. But the current Id, Vgs=0, seems to be to high (18,7 mA instead 4 mA). The bias voltages to the gates are thus not the same. Galvanic separation with capacities and voltage dividers could help but I dont want do it. The colpitts oscillator capacities should have higher values (I use 2.2 and 3.3 nF with the coil of 471 µH) to get an nearly sinusoidal signal. With the bipolar transistor constant current source Q1 the antenna circuit signal is now fewer distorted. 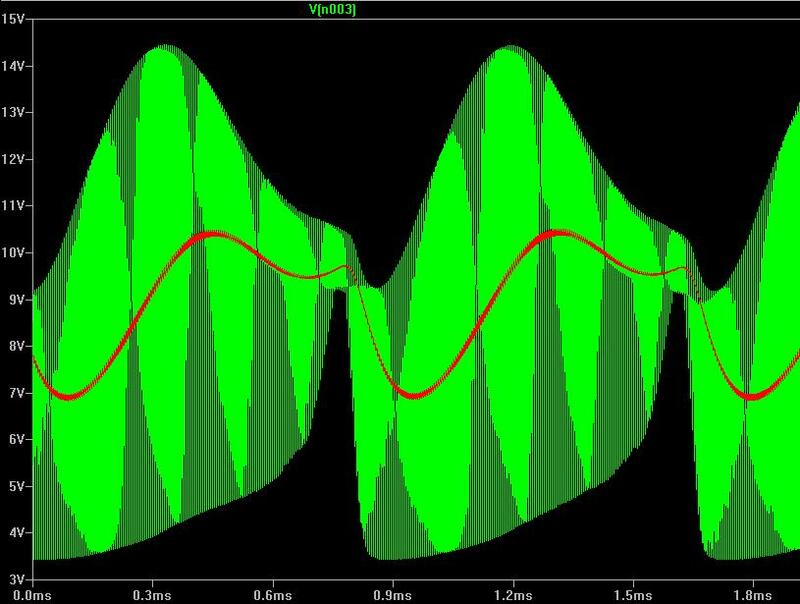 A special effect of my pitch oscillator is the signal at the simultaneously used source resistor Q1 for both jFets J1, J2. The halfperiods are cutted in dependance of the parameters used. One already distorted rf signal goes to the mixer. Here is a result for a signal probe befor and after the r.f. filter. JPascal, I use J113 for low voltage circuitry because VT is guaranteed to be between -0.5V and -3V. For higher supply voltages I might try the J112 instead where VT is between -1V and -5V. There is a question I dealt with, but I think many others here did it too. The shape of the time signal varies often over the frequency range. But the timbre sounds always similar. What is the reason of that? An explanation is the filtering of the r.f. signal which is necessary for demodulation. A simple low-pass filter turns the phase of harmonics up to 45° at the bandwidth limit. Using a very deep basic tone, the harmonics are low distorted, while a higher tone leads to more phase turning of the harmonics. For illustration 3 sinusiodal signals from basic tone and 1. and 2. harmonics are added with variation of initial phases. The sound you can hear is always exactly the same. But the time signal looks quite different. This is because the ear is fairly insensitive to absolute phase. Google it and you'll get plenty of relevant articles. We can detect differential phase with two ears (stereo imaging of a stereo signal). And, since phase is a delay, we can detect phase differences with percussive and other types of highly time dependent signals. But for relatively constant mono signals (e.g. Theremin) your ear is essentially deaf to phase differences, so waves that look radically different can sound exactly the same (as long as they contain the same harmonic amplitudes). This fact is sometimes used in sampled instruments. An algorithm can take a signal, reduce it to harmonics, then play with the relative phases of each until a the lowest combined amplitude (or some other useful criterion) is found. You are welcome in my laboratory, dewster. My point is not the ear physiology of mono signals. My "basic experiment" is only to explain the phase distorsion itself due to the filtering for separation the tone signal from the mixed radio frequency. It makes therefore no sence for theremin development to analyze the shape of time signal allone without FFT frequency spectra. By the way: We can recommend "google the internet for all things considered" and close the threats here. JPascal, there seems to be a language barrier thing working here? I apologize for perhaps misunderstanding your basic inquiry, which I guess now I really don't understand? The term "phase distortion" in particular is confusing me. 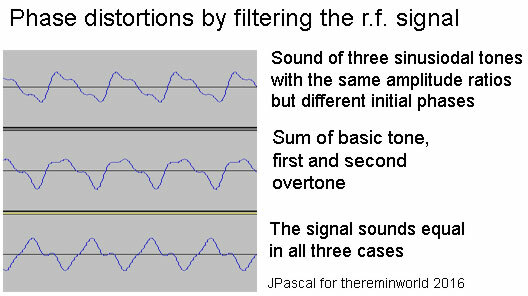 Filtering always affects phase, but it isn't generally perceived as audible distortion per se. I mostly agree with your statement "It makes therefore no sence for theremin development to analyze the shape of time signal allone without FFT frequency spectra" though I would qualify that by noting that there is no one-to-one mapping between harmonics and waveform, but there definitely is a mapping the other way (a given harmonic content can have many waveforms depending on the phase of the harmonics, but a given waveform can only have one harmonic content). And I realize that telling people to Google stuff can be used as an insult, but I certainly didn't mean it that way. I mean phase shifting between the time signals of harmonics. "Phase distortion" is more used in digital signal processing but the effect by filtering is the same. Your explanation of the dependence between time signal shape and frequency spectrum is what I meant. Thank you. Now to the next little illustration. 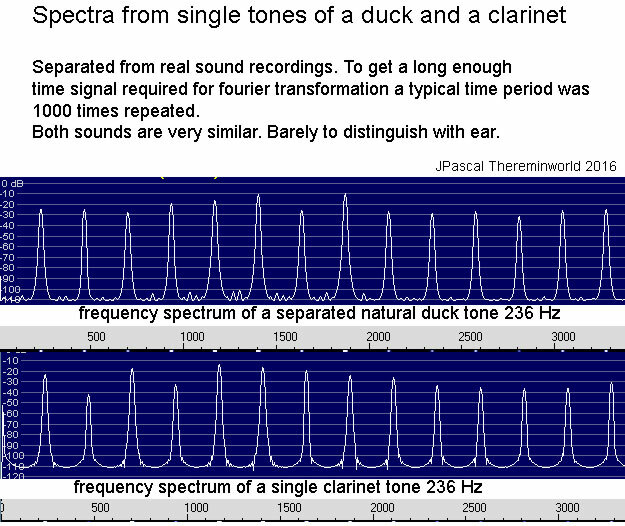 I made an experiment which shows that an instrument like a clarinet and a duck quack are similar in overtone ratios. Both are very rich of harmonics and the recordings of time signals are not to distinguish by ear. The method to get the harmonics I will use later to analyze recordings of Rockmore RCA. A next step in my theremin project.